This third version of the Russian AT-AT Driver figure has only recently come to light. As you can see from a comparison with the two other versions of this figure, the card is completely different. Interestingly, however, it does feature the symbol found on the other two cards, as well as the words "plastic toys," which is also found on the tackier-looking of the previously known cards. But perhaps the coolest feature of this card is the artwork, which actually depicts the AT-AT Driver figure. 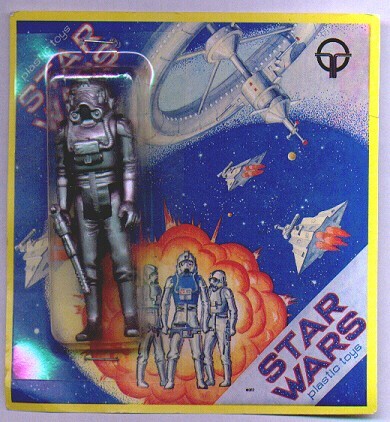 The emphasis on this one specific figure is further evidence that the AT-AT Driver was the only figure of this bootleg "line."